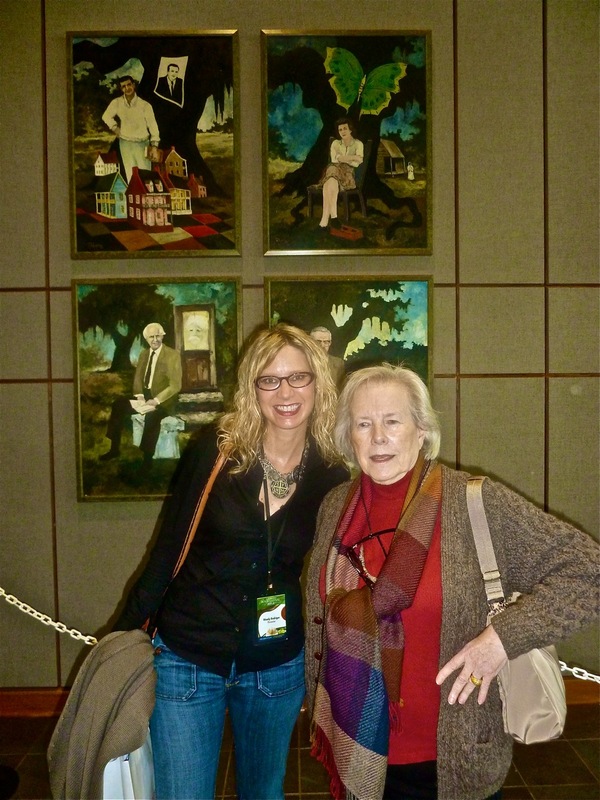 Musings of an Artist's Wife: I'm a Writer! 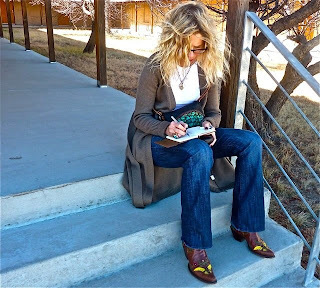 Author Patty Friedmann cheered the hand-written word after seeing the photo below. It was December 2010, and I scribbled on the pages of a purse-size artsy notebook, purchased annually in multiples from the Morgan Library museum shop. George Rodrigue photographed me as I sat on the steps of a former military base, one of eight bunkers now housing Dan Flavin neon installations at the Chinati Foundation in the remote town of Marfa, Texas. 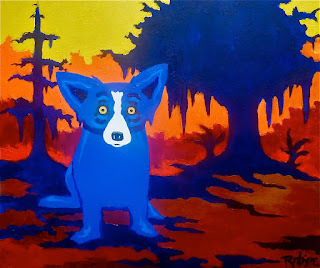 Gambit spotlighted their essay for a week with a photo on the New Orleans newspaper’s opening page, and numerous art sites shared the funny Musings account of George Rodrigue’s Marfa comments long before he talked me into risking a public facebook page of my own. Thousands of readers, whether or not they accepted concrete boxes and crushed cars as art, related to these stories for their honest and non art-speak account of a minimalist installation designed, let’s face it, for the art elite. Recently while waiting in line at a pharmacy window, a woman asked me in one breath, as New Orleanians will do, my opinion on this newly renovated Elysian Fields Walgreens and if I thought she overdid it that morning on her royal blue eye shadow, a gift from her daughter. She leaned hard against the railing, obviously in pain from her recent knee replacement surgery, and I knew that my standard reply, I have an art gallery with my husband, moves quickly to “What kind of art?,” followed by “What does he paint?,” followed by “What’s the story of the Blue Dog?,” all more than I felt like answering on this Sunday morning and certainly more than she needed in her uncomfortable condition. I’m a writer, I stated verbally for the first time in my life. I back-pedaled, explaining that I work on art books, and that unless she was into modern art, she probably wouldn’t have seen them. ….and before I knew it I was exactly where I didn’t want to be….explaining the history of the Blue Dog to a growing crowd at Walgreens while the artist himself waited in the car outside, where he called our brunch guests, explaining that we’d be late and wondering what on earth detained me. My heroes are writers, just as my heroes are artists, and I stammer in reply to what I see as an undeserving title. 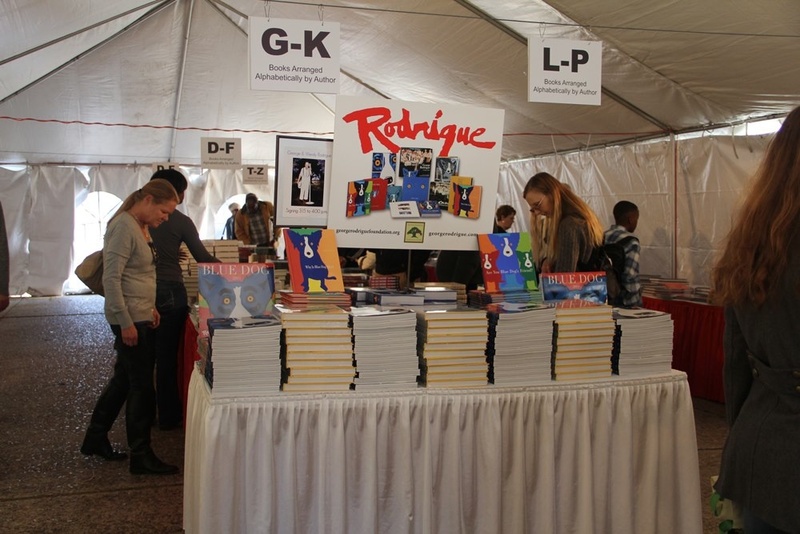 I’ve contributed to, compiled and/or edited eight Rodrigue books since 1994. Yet it’s not the same as writing my own. It was author David Lummis who first labeled me a writer and gave me the courage to use the word within bios and on-line. Now, thanks to a persistent and courageous UL Press, I’ll release my first solo book, a collection of essays from Musings of an Artist’s Wife, in bookstores nationwide, Fall 2013. Will you join me on the book tour? I asked George, laughing, as I imagined him swapping out old sharpies and spelling dedications in my ear. Well, FINALLY! You're not just a writer, you're a wordsmith. Your next job will be to see how lyrically you write. And then you will acknowledge (as I think you already do because, as an art critic, you have to)that you know how to layer meaning without your reader catching on. And then...and then...and then you won't say you're a writer, you'll say you're an author!!! Yay!!! You've always been a writer in my mind. 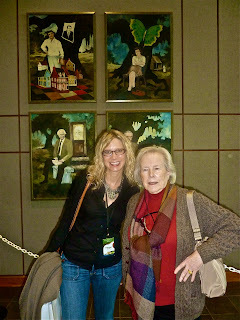 You have one of the best voices, and if you recall, I used your RATS story to teach voice to my students. Very happy and excited for you! Sincere congratulations! RE your being a writer, I just stated the obvious. Your blog posts have moved (and educated) me again and again, and I'm delighted they'll now be reaching an even wider audience. Congratulations! !